Parasitic wasps play an important role in gardens, providing organic, natural pest control. The wasps prey on common garden insect pests such as whiteflies, moths, beetles and fly larvae. To encourage parasitic wasps to stay in your garden, include a variety of plants that provide shelter, food and overwintering sites for these beneficial insects. Although some gardeners believe that Queen Anne’s lace is a weed, the plant strongly attracts parasitic wasps, which find the nectar an important food source. The plant falls into the wild carrot family and even resembles a carrot plant during its first year of growth. In the second year of the plant’s life, large, flat clusters of white flowers appear on leafless stalks. The drought-tolerant plant grows up to more than 3 feet in height, preferring full sun and well-drained soil in hardiness zones 3 to 10. Parasitic wasps overwinter on yarrow plants and rely on the plants for food sources, too. The highly aromatic perennial grows up to 3 feet in height with clusters of flowers varying in color from white to yellow, red and blue. The drought-resistant plants thrive in hardiness zones 3 to 9, preferring acidic soil in full sun. Plant yarrow from seeds in either the spring or fall. In June and July, you can collect a few of the yarrow plants, dry them and use them in place of cinnamon or nutmeg. Make sure to leave plenty of plants for the wasps to use as a winter home. Forsythia bushes provide an important food source for parasitic wasps. Early forsythia (Forsythia ouata) grows in hardiness zones 4 to 7, preferring sun to partial shade. The bush grows up to 6 feet in height and width. The bright yellow flowers appear in late winter to early spring. 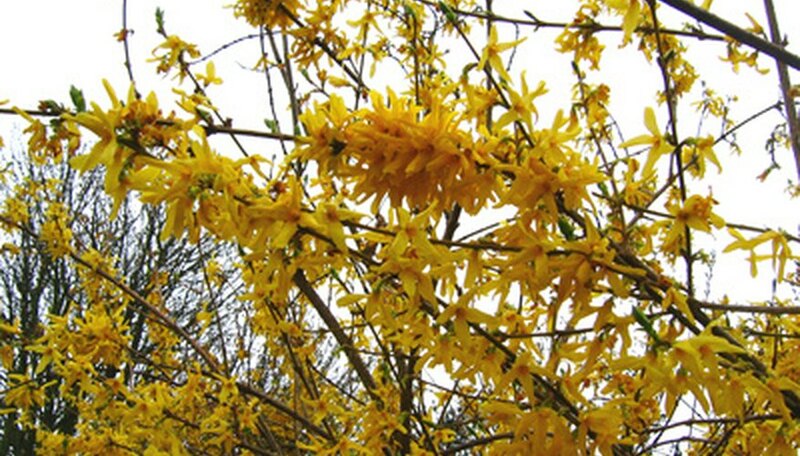 Another variety includes the weeping forsythia (Forsythia suspensa var. sieboldi). The plant grows up to 10 feet tall and spreads out to 15 feet wide, featuring golden yellow flowers in early spring. Both forsythias provide early sources of food for wasps when other plants remain dormant. Bridalwreath spirea grows in hardiness zones 4 to 8, where it provides a valuable food source in the spring and summer. The plant produces a profusion of double white flowers in early spring with yellow orange to purple foliage in the fall. The deciduous tree grows in almost any soil type except for wet soil. Growing up to 9 feet in height and 8 feet in width, the drought-resistant plant prefers full sun.